Supporting & promoting the fashion industry in Austin by building a network, promoting entrepreneurship, highlighting innovation, and encouraging cross-sector collaboration. 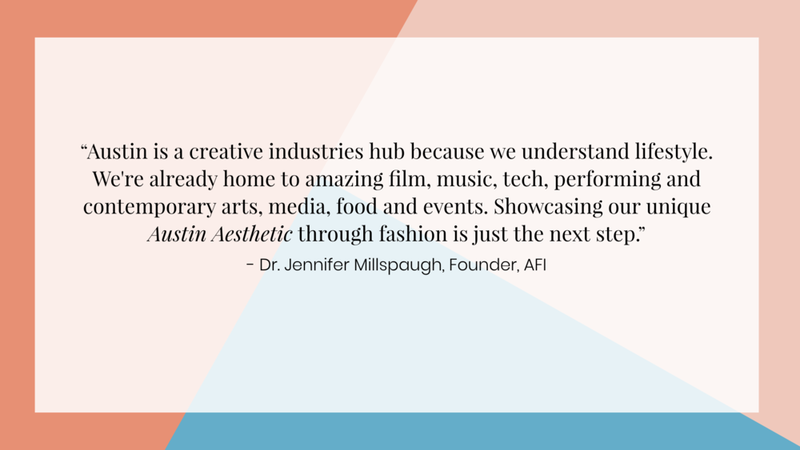 The Austin Fashion Initiative (AFI) connects you to a growing community of creative entrepreneurs, innovators and professionals. Whether you're a designer, stylist, manufacturer, retailer, industry consultant or affiliate business, AFI exists to build the community that is designing the future of fashion in Austin. Become a member of AFI to access exclusive events and a network of professionals engaged in the development of Austin's fashion industry. Or join us at our monthly meet-ups to learn from some of Austin’s most innovation fashion brands. Join us for Austin Fashion Initiative's (AFI) monthly meetup at Austin's newest co-working space: The Riveter where we'll be featuring a panel for an in-conversation discussion on sustainability and innovation. Leveraging the unique assets of the ATX startup and creative economy, Austin Fashion Initiative (AFI) brings together fashion industry professionals and stakeholders to develop an engaged network. Our goal is to amplify Austin as a center for fashion innovation globally by strengthening our community locally. We host networking events to bring the industry together, highlight local brands, and build impactful connections. At each event we highlight relevant issues effecting the industry at large, while distilling the content to make it actionably relevant for Austin’s industry. Join us to meet the innovators making an impact. Becoming a member of AFI provides you with access to a dynamic and engaged community of professionals and organizations. Our membership levels are designed to fit your stage of growth, and are ideal for professionals and brands operating in the fashion industry or providing affiliate services. Join us in designing Austin's fashion ecosystem!